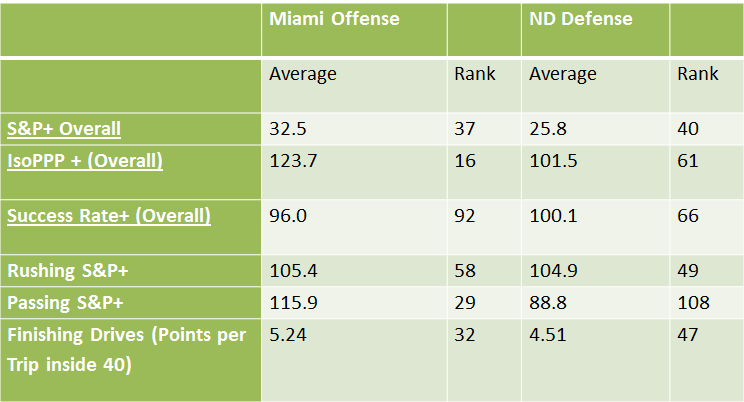 Previewing the advanced stats of Miami in Notre Dame in a game renewing an old rivalry. Brad Kaaya versus DeShone Kizer! 2-5 vs. 4-3! Feel the excitement! If looking for additional information on the statistics and terms used here, great starting points are Football Studyhall’s Advanced Stats Glossary, Bill Connelly’s Five Factors, and Brian Fremeau’s FEI ratings. The Canes looked like a good candidate to be the best team the Irish faced in 2016 through their first four games. After feasting on early cupcakes, Mark Richt’s new crew walloped a solid Appalachian State team 45-10 in Boone, and then cruised to a 35-21 victory over Georgia Tech in Atlanta thanks to three turnovers and two defensive touchdowns. 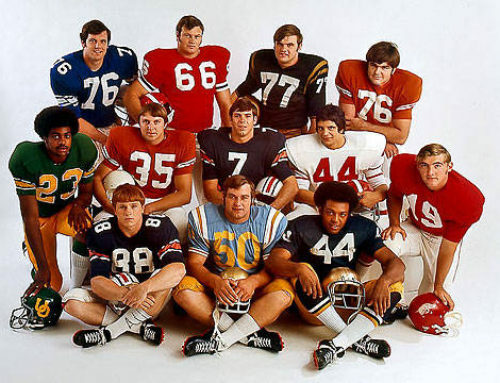 Since then, “the U” has crashed back down to earth. 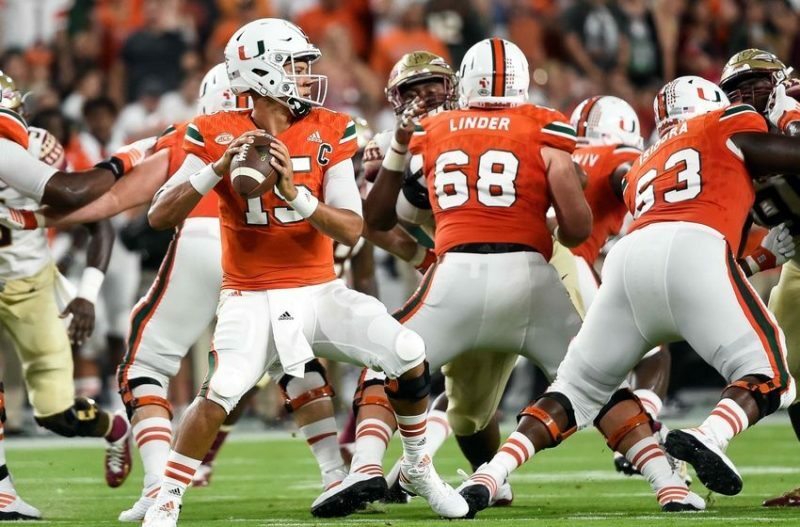 The three straight losses have all been to quality teams, but the Brad Kaaya-led offense fell off significantly versus FSU, UNC, and Virginia Tech. The Canes have hovered around 5 yards per play the past three games (4.65, 5.00, 5.12), a number that for the season would place them squarely in the bottom third of FBS teams. The defense looked to be more consistent and solid in the home losses to the Noles and Tar Heels, and then was gashed by the Hokies in Blacksburg. 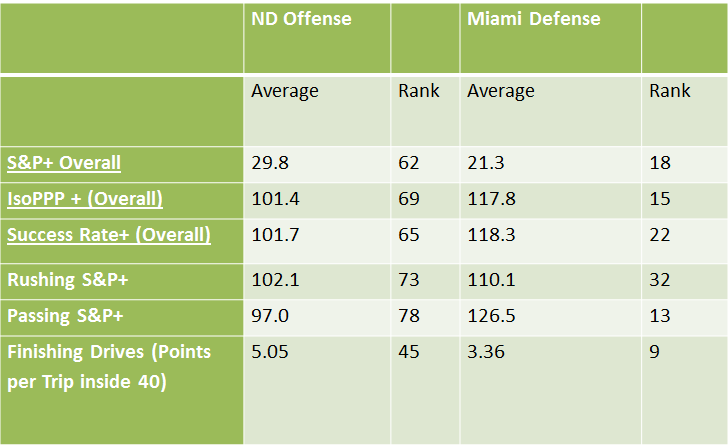 The Miami offense has been good but not great overall, leaning heavily on explosive plays. The Canes have 7 plays of 50+ yards in 2016, tied for 17th nationally. Paired with these long gains, though, is a lot of three and outs – only 60% of Hurricane drives gain one first down or more, 121st in FBS. Both of the Canes primary running backs, Mark Walton and Joseph Yearby, boast strong YPC averages (5.4 and 6.8, respectively) and highlight yards per opportunity (6.5, 8.0). Miami ranks 12th in rushing explosiveness but just 93rd in rushing success rate, with an offensive line that advanced stats view as pretty middling in run blocking overall. The passing game is rated a little better overall, but still shows a tendency towards explosiveness versus efficiency. Kaaya uses his tight ends to stretch the field vertically, with 6’4 David Njoku averaging 17.7 yards per catch and 6’4 Christopher Herndon averaging 16.5. Freshman Ahmmon Richards has been a big-play threat as well, averaging a Will Fuller-like 21.9 yards per catch. Kaaya has had a rough couple weeks, throwing for less than 225 yards in the FSU and UNC losses, and then being sacked eight times at Virginia Tech. He threw for a gaudy 347 yards on the Hokies, but had 41 attempts as the Canes fell behind quickly and were forced to air it out. The biggest mismatch in the game looks like the Miami passing offense, if Kaaya is healthy, versus the young Irish secondary. Notre Dame hasn’t really faced a dangerous passing threat since Syracuse, and it hasn’t exactly been a murderer’s row of opposing QBs in 2016 (which makes things seem worse, if possible). While the Canes haven’t been the most efficient, I expect Kaaya to take what the defense gives him, which could be a lot of throws underneath and attacking the edges. The Irish actually rank 14th in IsoPPP (which goes down to 61st with opponent adjustments), and have managed to avoid the big gains given up in the last 10 quarters or so. Forcing Miami to put together long, sustained drives plays to the Hurricanes weakness and the Irish defenses relative strengths. Miami’s defense has been super stingy, with an extremely disruptive defensive line leading the charge. They’ve been strong rushing the passer (29th in adjusted sack rate) and forcing negative plays in the run game (2nd in stuff rate). 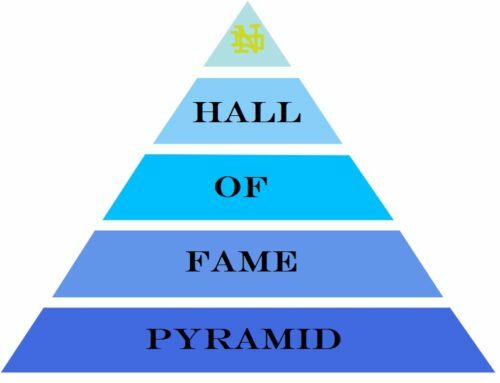 The Achilles heel if any has been allowing long runs (90th in Rushing IsoPPP defense), a category where the Irish have also struggled (94th). The defensive line is 1st in national havoc rate as a unit, and there doesn’t figure to be much running room for a Notre Dame rushing attack that’s been mostly stagnant this year. 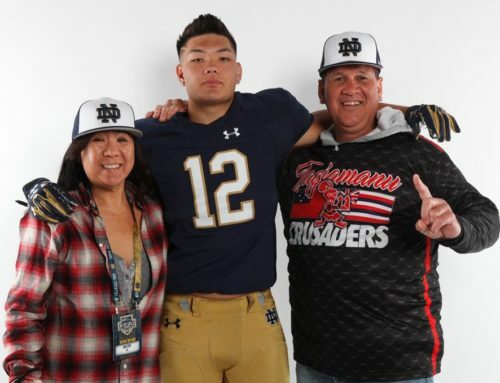 The Irish offensive line has been curiously bad protecting DeShone Kizer on standard downs – ranking 126th in standard down sack rate compared to 31st on passing downs. With low expectations for the running game, there should be a ton of pressure, both literal and figurative, on Kizer in this game. Play calling is always an easy area to criticize, but it seems that the Irish have been pretty vanilla even with offensive struggles over the past two games. Virginia Tech was able to move the ball well on a beat-up Miami defense with a combination of QB runs/scrambles (Jerrod Evans ran for 106 yards on 10 carries) and hitting some well-timed trick plays. As noted in the Stanford preview, the ND offense has been terrible on 3rd downs this year. The Irish are 124th in S&P+ on 3rd down, and the Miami defense has been worse on 3rd (44th in Defensive S&P+) compared to other downs (19th on 1st, 28th on 2nd). If this continues, it will be key to Notre Dame to play aggressively and convert scoring opportunities against a Hurricane defense that’s been excellent in the red zone. Only 50% of opponent red zone visits have resulted in touchdowns against Miami, tied for 17th best in the land. Expanding our view to look at points per drive inside the 40, the Hurricanes defensive average of 3.36 points per scoring opportunity ranks 9th nationally. 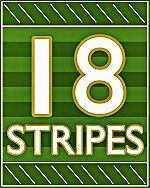 Quite simply, if this is a close game, Notre Dame needs to score touchdowns and not field goals. It won’t be easy, but Brian Kelly needs to adopt an underdog mentality in this game and make the most of limited possessions with teams ranking 126th and 91st in adjusted pace. MB: Miami 21, Notre Dame 17. I think this will be a game with few possessions (both teams play at a deliberate pace) with both teams struggling to move the ball consistently. I think the Irish play up to the level of competition, but fall a little bit short against a team that overall still has advantages on both sides of the ball but is struggling with confidence and injuries. Hm. So the predictions certainly look to be reasonable and accurate, the part I’m most excited about finding out with this game is what particular method of soul-crushing it’ll employ. After the Zaire debacle last week and the air-attack in a hurricane we’ve seen over the past two games, I’ve got some high expectations for this one. Or soul exhilarating… can go that way too! Beat the Canes!